Situated in a beautiful hillside location only twenty minutes from central Taipei, our restaurant offers delicious Asian and Western cuisine in a friendly, homely environment. Please take a look at our menu. 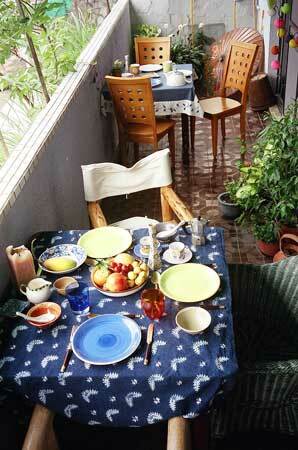 Sit outside on the balcony and enjoy the peaceful mountain scenery, relax inside and listen to your choice of music. Or do both – move around and make yourself at home. Important update: We regret to inform customers that we are currently not offering restaurant service to the general public. Recently we are often fully booked with cooking classes and other events, and the small size of our company would make it impossible to provide all these services simultaneously and still maintain our normal levels of quality and customer care. If you would like to enjoy a meal here with friends and colleagues, this is still possible as part of a private cooking class. Please book well in advance.